We were recently contacted by a John Wells from japan who is a great grandson of the writer H.G. Wells. He was researching his family history and had found that the grandfather of H.G. Wells, Joseph Wells, was buried in Shorne churchyard. The grave is included (section D no. 154) in the survey of memorials that is on this site. 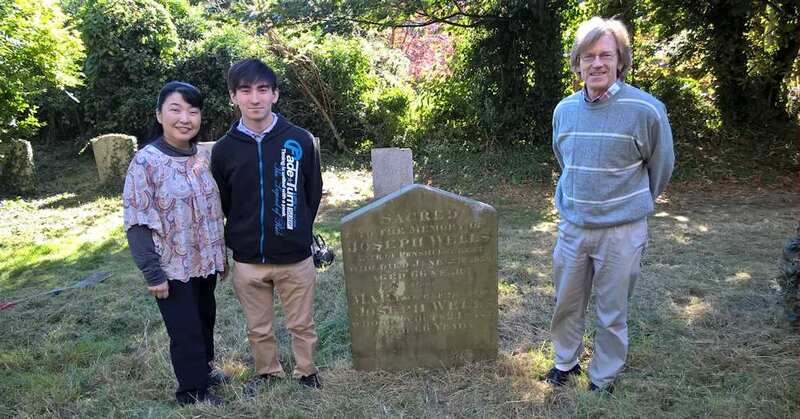 Last month Mr Wells, with his wife Tomoyo and son Ken, visited the churchyard to see the grave. 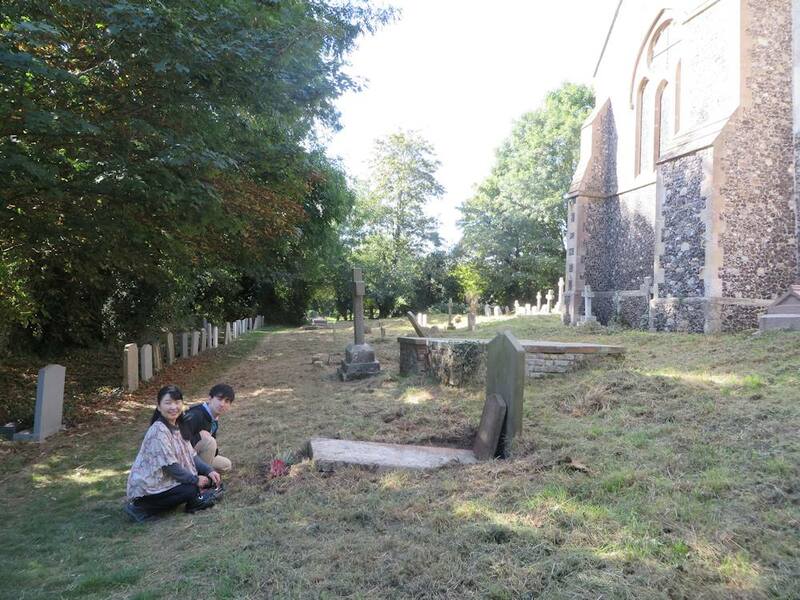 They and the grave are shown in the accompanying photographs (see above and below). They were visiting England to attend a commemoration of the 150th anniversary of H.G. Wells’ birth, held in Woking on the 21st September, when a statue of him. was unveiled. Woking is where he and his wife Jane lived while writing War of the Worlds, etc, and was first acclaimed as a writer. 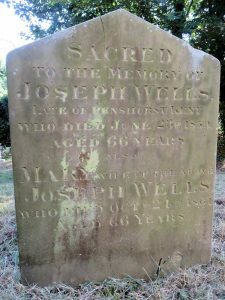 Joseph Wells (who was born in Ireland) and his father Edward before him were head gardeners at the Redleaf Estate near Penshurst. This was a significan garden at the time and received a very enthusiastic write up in the Gardener’s Magazine of July 1839 by J.C. Loudon the famous Scottish garden designer and botanist who founded that magazine. While there Joseph raised the first dwarf dahlias. The owner of the estate, by coincidence a William Wells who was not related to our Wells, died in 1847 and it was probably soon after that Joseph moved to Shorne as he was recorded as living there with his wife Mary and daughters Elizabeth (a milliner aged 18) and Hannah (a scholar aged 14) in the 1851 census. The reason for moving to Shorne is not known, nor anything about his life there or in which house he lived. Although the 1851 census does not give addresses it appears from the entry’s context that their home may have been near Pipes Place. In his will, made while living in Shorne, he described himself as a farmer. 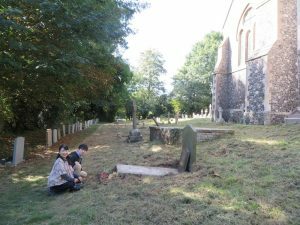 The grave, which is covered by a stone slab and appears to be lined with brick, is opposite the north-east corner of the church by the grass path; it is not easily recognised as the inscription is on the back of the headstone, facing the church. According to the gravestone Mary lived just over another two years but she is not shown in the 1861 census which was taken in April of that year even though she died the following October. Nor is there a record of her burial that year in the church’s burial register. One explanation is that she had moved from the parish before her death and is buried elsewhere. 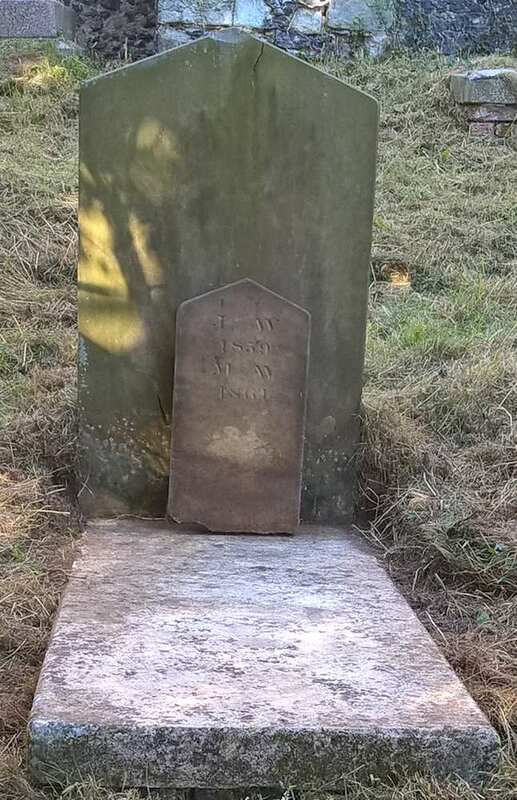 However the burial register for Shorne shows the burial of a Mary Wells on 31st October 1860 and letters of administration to her estate give her death as the 24th October 1860 so it is probable that the gravestone appears to give the wrong year for her death. There was a William Wells and his family living in Thong recorded in the censuses of 1841 to 1871. William was shown as an agricultural labourer and then a bricklayer. Could there be a connection between these families and could that be the reason for Joseph moving to Shorne? It could easily be a coincidence. Joseph’s son by his first marriage, also Joseph and father of H.G. Wells, was gardener at Uppark a large estate now owned by the National Trust. It was there he met his wife. He was also a professional player in the Kent county cricket team and was the first cricketer to take four wickets in four balls in a first class cricket match. I am grateful to Ian Craig for the information from the censuses.